Our most recent women’s power rankings, from late January, are here. Conference championship season is upon us in the NCAA’s Division I, which means it’s time for the final edition of our NCAA Power Rankings. We’ll start with the women’s programs, almost all of which are kicking off their conference championships this week. For the sake of fairness, we’re trying not to take into account swims already done at a conference meet (like, say, the opening night of SECs) because it would involve comparing suited, rested swims for one team to midseason swims for another. At the conclusion of the conference round, we’ll be back with our official NCAA Predictions. SwimSwam’s Power Rankings are somewhere between the CSCAA-style dual meet rankings and a pure prediction of NCAA finish order. 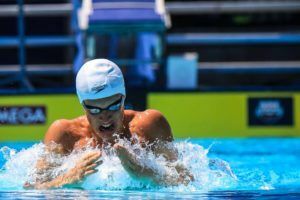 SwimSwam’s rankings take into account how a team looks at the moment, while keeping the end of the season in mind through things like a team’s previous trajectory and NCAA scoring potential. These rankings are by nature subjective, and a jumping-off point for discussion. If you disagree with any team’s ranking, feel free to make your case in a respectful way in our comments section. A quiet stretch for Purdue has them losing a little steam after a huge midseason explosion. This time it’s the loss to Minnesota that has slowed momentum. A year-end taper like their mid-season performances, though, could make this ranking look silly. Took care of business against Purdue, but the Gophers have their hands full with a loaded Big Ten this week. 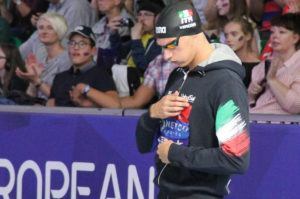 How will the young talent come through after a long course midseason rest meet made predictions on this team’s short course standing a bit cloudy? Lost to #1 Georgia, but it’s hard to knock that much. 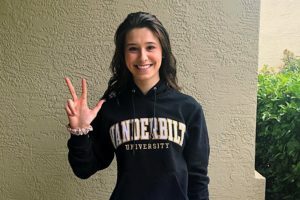 Wins over Auburn and Florida State were impressive, and Chase Kinney is swimming out of her mind. There’s a really good argument for Bucky the Badger to be ranked higher right now, but we’ll let Big Tens be a major referendum on just how high the depth allows Wisconsin to rise. A hard team to spot at this point. Feels like the Heels will vastly outperform this rank at ACCs, but after a blowout loss to Virginia and a simultaneous loss to NC State, there’s really no moving UNC up. No change for Mizzou. Beat a bunch of teams they should beat and looked solid doing it. SECs at home are a huge opportunity for the stars to sparkle. Auburn leads the back-to-back Tigers in our ranks. The loss to Wisconsin stings, but was a meet that came down to handful of early touchouts. The loss to Florida in a long course format is a bit more understandable. Let’s see how the young swimmers like Ashton Ellzey, Erin Falconer and Aly Tetzloff come through at SECs before we make any binding statements on Auburn. This is a fairly steep fall for the Vols after back-to-back SEC losses in brutal fashion to Georgia and Florida. The good news? 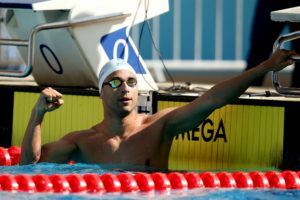 The opportunity for revenge is already here (and though it didn’t factor into our ranks, a 200 medley relay title suggests the Vols are ready to take it). The Gators get a boost after chomping the previous two teams in these ranks. 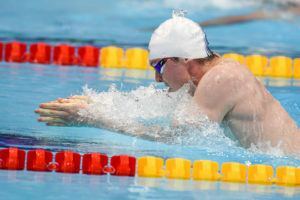 The absences of Theresa Michalak and Sophia Batchelor might be signs to worry, however, especially in the breaststrokes. 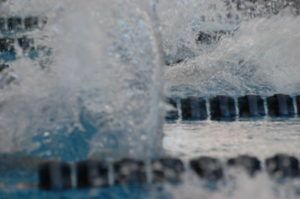 The ‘Cats lost to Cal and Stanford, but then swam Texas really tough (sweeping both relays) and looked fantastic in a throttling of Arizona State on the road. The freshmen look great, especially in the all-important sprint events with Taylor Schick, Annie Ochitwa and Katrina Konopka. The Wolverines beat Ohio State and Michigan State with relative ease, and brought in a ringer in Chinese National Teamer Yirong Bi. Their biggest threats at the moment? A red-hot Indiana team and a Norovirus scare on campus that may delay the Big Ten Championships. Indiana rolled past a top-tier team in Louisville. Has freshman breaststroke duo Lilly King and Miranda Tucker brought balance to IU’s force? Big Tens will tell a lot. Topping the Tar Heels for North Carolina supremacy was a big statement, and swimming Virginia as close as they did was an even bigger one. Can the Wolfpack women capture the same ACC relay magic their men have found the past several years? The loss to Indiana hurts, but Louisville is still an extremely talented team. There are a lot of strong programs in the women’s ACC, and this week should show whether the Cards can remain near the top of the deck. A win over Arizona was surprisingly close, but that owed mostly to the Wildcats’ two relay wins, as Texas pretty well controlled the majority of individual races. The Longhorns moving down is more a product of a team like USC moving up than a slight to Texas. The Aggies blew out LSU while swimming mostly off-events. Sarah Gibson is really starting to come around in the butterfly events for a deep A&M team. The biggest movers & shakers of the past month. The Trojans beat Cal and nearly toppled Stanford, marching toward Pac-12s as arguably the hottest team in the nation. The win against NC State was closer than expected, but it was still that – a win. Virginia’s too good to move down, and an American/NCAA record or two at ACCs could put them in the driver’s seat for a top 3 finish. Losses to USC and Stanford don’t inspire confidence, and the latter loss wasn’t even close. 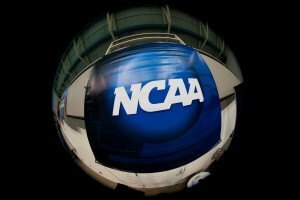 Still, the sheer amount of talent on the roster combined with last year’s NCAA title says it’s far from time to hit the panic button. The health of star freshman Katie McLaughlin, coming off a neck injury, is key. The win against Cal was over by the second diving break, and capped an undefeated season for the Cardinal. Ella Eastin has been a revelation, and is a frontrunner to be the nation’s best freshman this postseason. Make it 100 straight wins at home for Georgia after their rout of Wisconsin. Hali Flickinger continues to do it all, and Olivia Smoliga hasn’t looked this good since her freshman season that netter her an individual NCAA title. 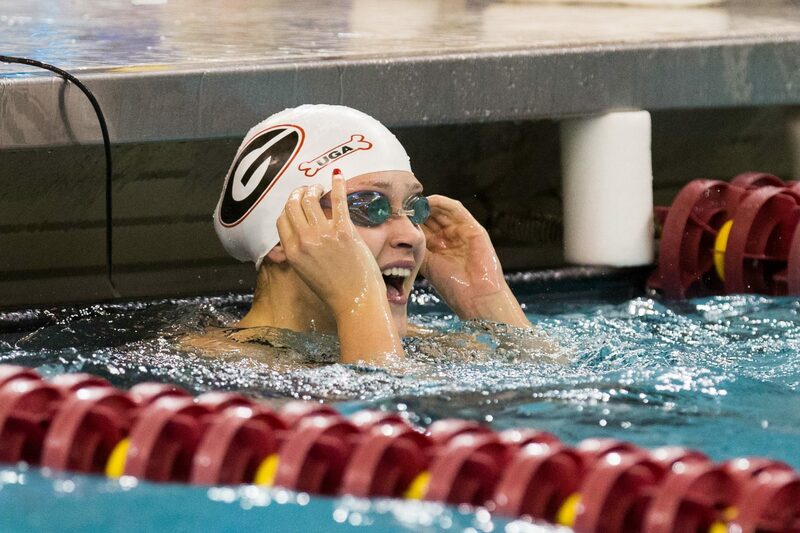 Smoliga’s rise coupled with Simone Manuel’s redshirt for Stanford make the ‘Dawgs the team to beat heading into the conference weeks. when will UCLA women’s swimming once again become relevant at NCAA’s? As a reminder……UCLA recruiting class ranks (per SwimSwam): 2013: #9, 2014: #9, 2015: #8.